John Moran Auctioneers’ October 2nd Traditional Collector catalogue featured a wide array of Continental furniture and decorative arts, Chinese and Japanese antiques, and American, European and Russian silver, all offered alongside works of art by American and European artists. In all, 420 lots were brought to the block on Tuesday. Some of the evening’s most hotly contested lots were silver selections by a variety of European and American makers. 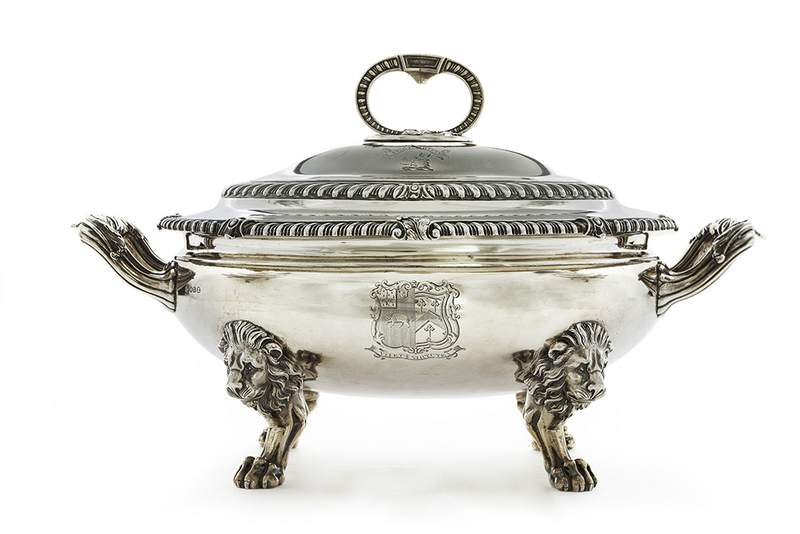 A George III sterling silver soup tureen by maker Paul Storr dating to 1812 was brought to the block with a $8000 to $12,000 estimate, bringing $10,000 thanks to interest online and in the room (all prices realized include Moran’s 25% Buyer’s Premium). A handsome eight-piece Florentine .800 silver tea service with galleried tray brought $2250 (estimate: $2000/3000). A finely finished Austrian enameled and gem-set ewer with oviform body achieved a $2250 selling price, over the $800/1200 estimate. Bidders online were enamored with an extensive Towle “Georgian” sterling silver flatware service consigned from a private collection. Comprising 306 pieces, the service was initially expected to bring between $5000 and $7000, which was immediately outstripped, ending in a $11,250 price realized. One of the earliest bidding wars to crop up on Tuesday was for a charming sketch by British artist, poet and author Edward Lear (1812-1888). One of the artist’s earlier works dating to 1837, “Alderly” depicted figures walking through a park. After a heated bidding war fueled by online bids, the piece earned $5000 (estimate: $1500/2500). Additional fine art highlights included a baroque oil painting depicting the History of Alexander the Great, executed in the manner of Flemish painter Frans Francken II the Younger (price realized: $6250; estimate: $5000/7000). Realizing an impressive $11,250, a highly detailed interior church scene with ladies waiting for devotion dating to 1868 by Belgian artist Juliaan de Vriendt (1842-1935) inspired multiple bidders to sign up to vie for the work via telephone (estimate: $8000/12,000). A number of clocks from the estate of Harry J. O’Connor III were featured in this catalogue, including Continental tall-case, desk and mantel clocks. A Swiss carved linden wood William Tell-motif tall case clock modeled after the Tell monument by sculptor Richard Kissling (1848-1919) from the O’Connor estate earned $16,250 (estimate: $5000/8000). A French chinoiserie gilt bronze-mounted tall case clock dating to the 18th century was offered with a $5000 to $7000 estimate. The piece proved exceptionally popular among online and floor bidders, bringing $11,875 at the block. A nicely modeled period French Empire gilt-bronze figural mantel clock surmounted by a standing figure of the Empress Josephine was offered for $2000/3000 (price realized: $4687). A pair of Russian Imperial porcelain handled vases found a buyer online, bringing $8125 ($8000/12,000). A monumental Japanese cloisonné vase decorated with irises and birds on a yellow ground was expected to bring $2000/3000; floor bidders brought the price up to $3125. A set of English target/dueling pistols by London maker Henry Nock dating to the late 18th/early 19th century earned $5937 (estimate: $1000/2000). A contemporary backstaff (a navigational instrument used to measure the altitude of the sun or moon) in the style of earlier 18th century examples achieved an impressive $4062 price realized (estimate: $800/1200). Moran’s has an exciting lineup of auction events slated for the rest of 2018. On October 23rd, Moran’s will host their inaugural Women in Art Auction, directly followed by their flagship biannual California and American Fine Art Auction. The catalogues for both events are now live online on Moran’s website as well as via Liveauctioneers and AuctionZip. Full-color catalogues are also available for both of these auctions. On November 13th Moran’s will host their 20th Century & Contemporary Design Auction, followed by Prints & Multiples; Moran’s is taking pre-orders for the full-color catalogues now. December features a robust lineup of auctions spread across two dates; December 11th will feature three separate auctions: Fine Jewelry & Luxury, Studio Auction – Jewelry, and Rare and Important Timepieces from a Private Collection. On December 12th, Moran’s will host their Art of the American West auction.